I received two books for review. Gated paperback ARC, and a finished hardcover of Fire With Fire. That's all I got, which is good cause I've been trying to get to my packed TBR pile. I'm currently reading Gated and I'm enjoying it! Looking forward to review of it! Burn for Burn is on my wish list. Good to see it's just not me trying to be good! Gated looks so good and I love that cover, I still need to read Burn for Burn but the second book is on my wishlist. OOh nice! Been seeing these around! Hope you enjoy them as well! Another reason to get envious. When will I start getting those physical ARCS, Shane? They look so lovely. And I can totally relate with you slowing down on getting additional books. The TBR pile is sooo damn overwhelming. I really need to cut back on my book buying or ARC requests so I can conquer that pile. I got Fire with Fire too and completely forgot to mention it! I hope we both enjoy! Gated looks awesome. Sometimes small hauls are necessary because they allow us to catch up. I'd never seen gated until Friday at the book store. Since then, I've seen it a bunch of times on different blogs. Looks good. I'm going to go check out your review. Thanks for visiting. I bought a copy of Burn 4 Burn a couple of weeks ago. I'm excited to check it out. Great haul and thanks for stopping by! They both look good. I'd like some time to read books from my TBR pile. Come see what I got at Ms. Martin Teaches Media and Inside of a Dog. Happy reading! Gated sounds really interesting. Happy Reading! I'm actually starting Gated today because my review for it is scheduled later this week. It sounds good, but having just read Escape from Eden (another cult-ish book), I'm not sure I'm really up for it after all. I'll have to check out your review for it. Good on your for tackling your pile, I need to do more of that myself. Enjoy your new books! Nice! I would love to get a finished copy of Gated, it was really good. Happy reading. Very curious what you'll think of Gated. Great haul and happy reading. Thanks for stopping by. Hope you enjoy Gated. Great books this week. 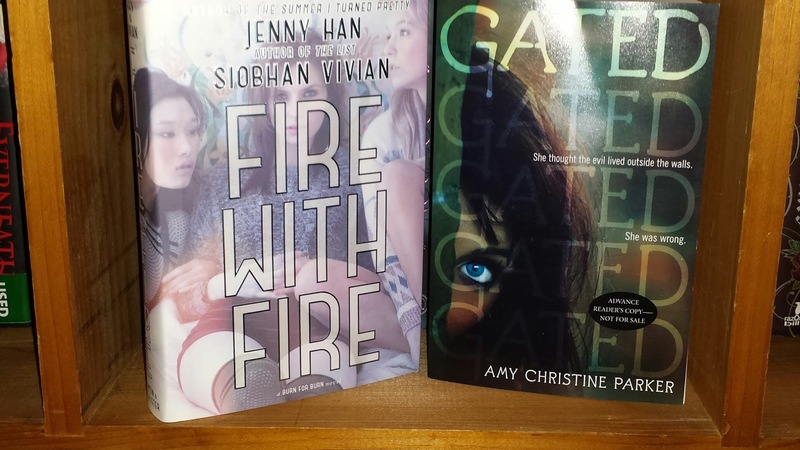 I'll add Fire With Fire to my TBR list. Happy reading and thank you for stopping by! Great covers for your books this week! I hope you enjoy them! Gosh darn it. I've been dying for Gated. So jealous that you got it. Thanks for stopping by and following! I followed you back on twitter, FB, and am an old bloglovin follower!! I haven't heard of either of these. I hope you enjoy! Thanks for stopping by! These are two on my list to read. Hope you enjoy! I haven't heard of these but I hope you like them! I've heard both books are excellent. Enjoy, Shane! I just added Burn for Burn to my list to read! Hope you like these books! I'm now following you! I read Gated and it wasn't my cup of tea, but hopefully you'll enjoy it more! Fire with Fire is huge, holy moly! I'll have to pick it up since I really enjoyed Burn for Burn. Happy reading, Shane! Gated looks so good! Hope you like it! I haven't read Burn for Burn yet, but I intend to do it when I have some time. I have got to read Gated. I am hearing some great things about it! Have a wonderful week, Shane! Great books. I'll be interested in reading what you think about Fire with Fire. I read Burn for Burn, but wasn't crazy about it, yet I am curious as to what happens. I still haven't read Burn For Burn! I love revenge stories though so I know I'll get to it sooner or later :) I hope you enjoy the sequel!